The new year is upon us—and my single prediction for 2015 is that this will be THE YEAR that Marketing will be on center stage in the corporate limelight. After a decade of innovation in marketing technology and now ubiquity of Internet access, the convergence of digital buying and digital marketing will finally enable marketing to become the powerhouse of growth. Are you ready to be front and center? I hope so. This week, I’ll highlight a few key areas that will need your focus, so consider incorporating them into your marketing plan for the year, and please feel free to share these predictions and insights with your network. Today, I want to paint a new vision for how to think about operationalizing marketing automation and related marketing technology: building your Demand Factory™. Then we’ll look at marketing technologies, followed by a resourcing strategy I call Marketing-As-A-Service. Lastly, I’ll discuss new brands to watch in marketing technology and wrap up the week with the new role of the data scientist. For B2B marketers using marketing automation, the past few years’ recipe for success has been understanding and operationalizing the demand funnel. Conferences and consultants evangelized sales alignment with best practices like “don’t call everything a lead.” The core messaging was that in order for Marketing and Sales to play well together, you have to culturally align and establish an integrated lead management process. All that excellent advice still applies — but it’s time to go far beyond the funnel framework and design and operationalize a Demand Factory. Picture the raw materials that enter the Demand Factory by the truckload: unqualified leads from omnichannel marketing. Watch these unqualified leads move along the “conveyer belt” — through the lead scoring system —which segments and routes them into the proper intake bins — automated data segmentation. See how the “factory robots” — your program triggers and feeders — retrieve each of the segmented leads and move them into the next phase of production. Visualize the “refinery” area — the nurture systems, remarketing engines, and dynamic content platforms —further refining them to a finished product: a customer. Now picture the plant manager — that’s Marketing Operations — in the control room — leveraging your Marketing Dashboard —where production cycles and output are easily and accurately monitored and forecast. This Demand Factory has everything you need: the process, infrastructure, automation, resources, data and monitoring systems to turn leads into customers, to turn customers into loyalists, and retargeting programs for the vast majority of the leads that didn’t follow the path to purchase. 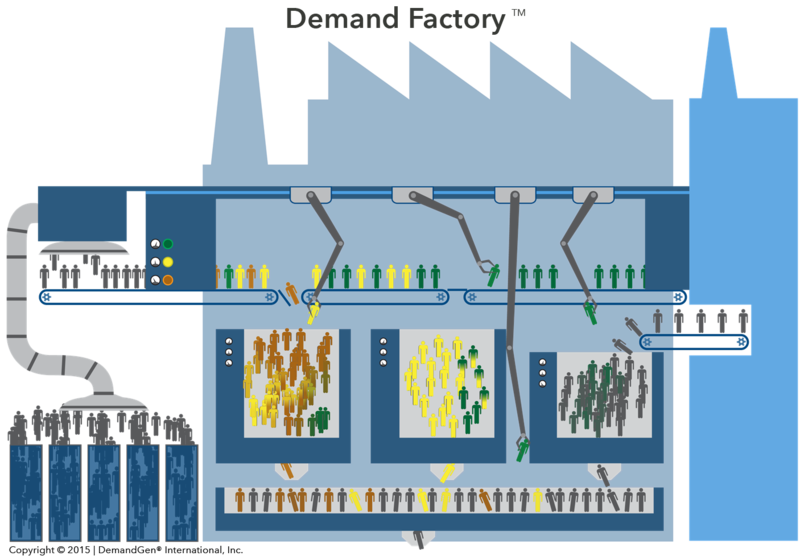 That’s the vision in a nutshell: the Demand Factory framework is the next evolution of demand generation, and it’s here now. Building, automating, and optimizing your Demand Factory isn’t a short-term initiative, of course. Doing so will require an investment in marketing infrastructure and resources that most marketing leaders aren’t budgeting for — yet. The teams that do build Demand Factories, though, will shift the power of revenue generation to Marketing, essentially turning their departments into the epicenter of growth for their firms. And what about the Marketing teams caught in batch-and-blast mode? Well, sadly, they will continue to suffer through the daily grind of the “campaign de jour” approach to marketing. Without building the automated Demand Factory, the staff will burn out and end up turning to LinkedIn to seek out their next jobs — only to start the bad batch-and-blast habits all over again. The marketers I worry most about this year are the unfortunate ones embracing marketing automation for the first time who often get misled by vendors’ promises of quick and easy results from just buying a marketing automation system. Those folks feel that they’re supposed to brave the journey alone, and will spend part of the year thinking “this is harder than I thought!” Marketing isn’t easy, so how could a marketing system possibly be easy? The truth, as most of us know, is that turning what often is used as a spam cannon into a Demand Factory requires an investment in resources, change management, ongoing innovation, and thoughtful integration. Take it from me, after a decade of helping firms (and yes, getting a few gray hairs! ): it is NOT easy, and you do NOT have to go it alone. For the ones who do invest the time and resources to build, automate, and optimize their Demand Factories this year. . . they have a real shot at getting the MVP award at their firms in 2015 by “Making Marketing Matter.” It’s a commitment and it takes work, but aren’t the most rewarding things in life like that? As we all shift our mindsets beyond “the funnel,” this vision is just the beginning. Over the coming months, you’ll hear a lot more from DemandGen around building, automating, and optimizing your Demand Factory. Next Up: “Cloudy with a Chance of Awesome”: Santa brought us a load of new marketing technologies this season in a big box labeled Marketing Cloud. For the past decade, David and his team at DemandGen have been at the forefront of the transformation taking place in marketing by helping 100’s of the top sales and marketing teams around the world incorporate marketing automation to drive growth. David is accomplished industry speaker, thought leader, and author. His ground-breaking work on the transformation of marketing and sales is at the heart of his book, Manufacturing Demand: The Principles of Successful Lead Management.